Humility is a virtue. And, for most of us, it doesn’t come easily. Particularly for those of us who want to be good at our jobs and to please to whom we report, owning up to a mistake at work can be a difficult task. Management professor Robert Sutton offers advice about how to deliver a truly effective apology in his book, Good Boss, Bad Boss. A recent article about Sutton’s advice summarizes it in three steps. The second example sounds more like blame shifting than an apology. Own up to the error fully. The apology should be commensurate with the mistake. 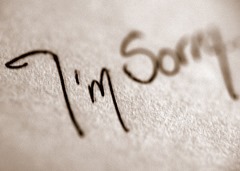 If you miss a big meeting, you should make your apology in person. If you are 15 minutes late to the meeting, a less formal face-to-face is probably required. Employees who offer a solution for the problem that they’ve caused come out looking like problem solvers-a positive attribute in any workplace. Can’t solve the problem? Then explain what steps you’ve taken to try to solve it. Just dumping the problem onto another person (particularly your boss) is not a good idea. At the same time, make it clear that you intend to ensure that the problem not occur again. Be clear that you won’t make the same mistake twice.